neutral (Group 1) base stocks, vacuum gas oils distilled from crude or used oils. Sulfur and nitrogen removal as well as aromatics saturation. Prior experience with capacities from 300 to 12000 bbl/day. Main objective is reduction of sulfur from oil. Aromatic saturation is necessary to produce Ultra-Low Sulfur Diesel (ULSD) meeting latest specifications. 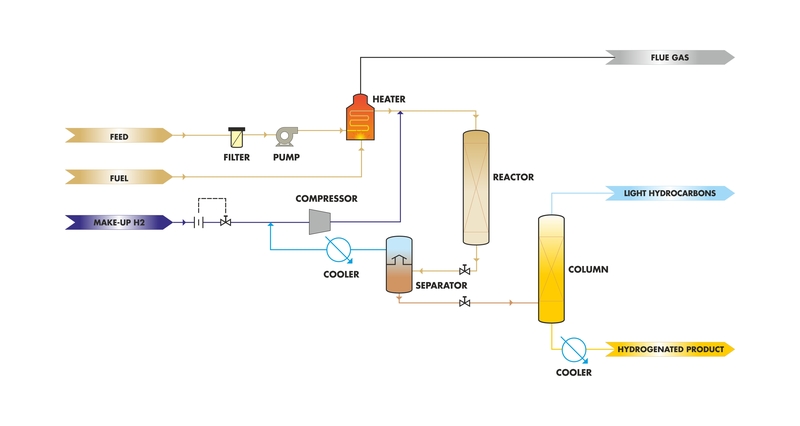 Bio-feedstock or renewable fuels contains fatty acids, resin acids and their oxygenates. Hydrogenation of fatty acid esters and other oxygenated compounds to produce saturated hydrocarbons. Water is the byproduct of the reactions. Sulfur is also removed from the feedstock by reaction with hydrogen. Net result is production of clean burning renewable diesel fuel. Design and supply of all equipment, steel, pipes, instruments and controls under one lump-sum contract. Industry-standard selection of metallurgy and safety systems. Every plant is custom designed. Modularization (skids) to the extent possible. Active support to Operations for years.